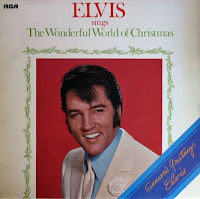 Unfortunately Elvis Sings The Wonderful World Of Christmas didn't get the FTD treatment this year. My bet is that it will be released in October 2011, when the album celebrates its 40th anniversary. Until then (or whenever it will be) we'll have to make do with what has already been released when it comes to outtakes from the sessions that gave us Elvis' second Christmas LP. And thanks to iTunes I've been able to create my own “FTD light version” of Elvis Songs The Wonderful World Of Christmas. * Bonus tracks from Christmas Duets, featuring additional instrumentation. The “FTD light version” of Elvis Sings The Wonderful World Of Christmas was done by using all of the alternate takes that have been officially released so far. They can be found on Memories Of Christmas, If Every Day Was Like Christmas, Platinum: A Life In Music, Today, Tomorrow And Forever, I Sing All Kinds and A Hundred Years From Now – Essential Elvis Volume 4. I really enjoy it, and I'm looking forward to the full version. Please bring it on next year, FTD, it would make for a nice early Christmas present! I just added the informal recording "The Lord's Prayer" to the track listing, as it was recorded between takes of "I'll Be Home On Christmas Day."